Wherever you are in the world - try 3 issues for JUST £5! Live outside the UK? 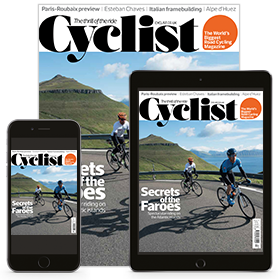 Not a problem, subscribe today to save up to £27 on your first 3 issues and we'll send you a copy of Cyclist magazine each month in print or on your digital device. Join the Cyclist community and get the magazine loved by road cycling enthusiasts around the world. Every issue is packed with the best rides and stunning photography, the latest bikes and kit plus exclusives from the pro cycling world.